Doors will open at 3pm. Meal will consist of Wild Game/Fish along with some brisket and chicken. Hopefully, the following information will answer most of your questions…. 1) A cooking team may consist of a group of individuals, a couple, or a single individual. A team may represent a corporation (bank, hunting camp, etc. ), restaurant, or simply be a local cook. LSBA is a tax-exempt 501(c) (3) organization. As such, we cannot endorse candidates for political office or participate in/endorse electioneering of any kind. Teams may have up to 4 members and all 4 members will receive a one year ($25 each) complimentary LSBA membership. You must fill out a cook team form to compete and to get your complimentary LSBA membership. Each team is encouraged to help sell 5 tickets to the event. 2) LSBA Wild Game Cook-Offs are a celebration of the game animals, game birds, and game fish that can be harvested and utilized for food. Therefore, “Wild Game” is defined as fish, fowl, or game that can be found in the wild of North America. We are also celebrating the people who harvest and/or utilize Wild Game for food. Teams are strongly encouraged to utilize fish, fowl or game that they have harvested themselves or have been harvested by other hunters and anglers. However, use of fish, fowl, or game species that are also commercially available does not result in disqualification. 3) There will be awards/trophies awarded for first, second, and third place in three categories: fish, fowl, and game. There will also be an award for “Best Overall”. Entry fees: 40.00 for entry into each category or 100.00 to enter all three. This will include 1 year membership to the LSBA (25.00 each) and free entry to the Banquet (25.00 each) for 4 member cook team that’s a 200.00 value. 4) Teams may enter up to one (1) dish in each regular category) If a team’s highest scoring dish wins one of the three categories, it will be in the running for “Best Overall”. 5) The Award for “Best Overall” will go to the cook team with the highest scoring individual dish. Dishes will be judged on taste and originality with taste weighted more heavily. Originality includes imagination, uniqueness, and difficulty of the dish. (The “Best Overall” winner earns the right to compete for the title “State Champion” at LSBA annual awards banquet at the conclusion of the season.) (we are just beginning this cook-off tradition and it will be held this year at the banquet in Columbus,Tx so this is the state championship!) Your team could be the first State Champion of the LSBA Wildgame Cook-Off! judging of fish, fowl, or game dishes submitted to the food judges. All teams are considered for the “Best Presentation Award” regardless of how their dishes score or place in the three categories. Access is available to the Cook-Off site on the day of the event for any participants who wish to set up for roasting, smoking, etc. Some participants may prefer to cook their entries at other locations and simply warm or reheat the dishes at the Cook-Off site. 2. LSBA membership pacs will be provided for up to four participants. 2. Warmer such as a large pot or chafing dish with heat source. possible. If you have access to a small generator please bring it. 4. Serving utensils. Plates and cups etc…. 5. Chairs and tables if needed. and that game makes excellent and healthy table fare. Cook-Offs would not be possible. 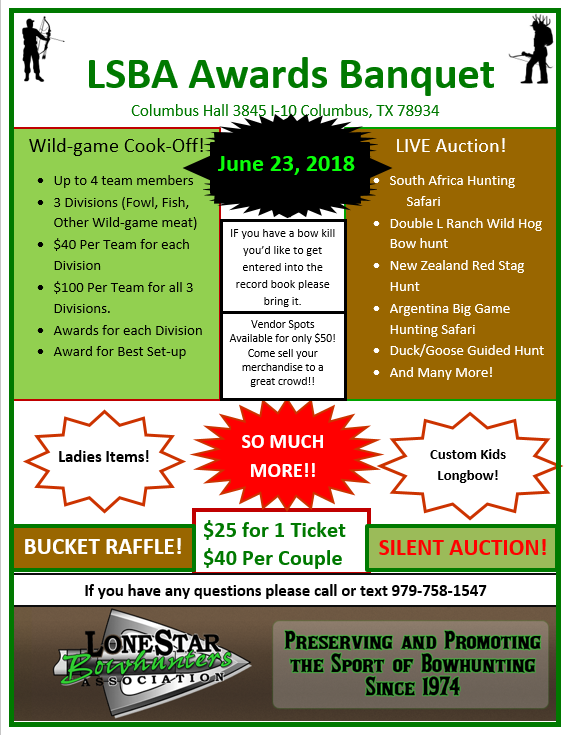 The Lone Star Bow Hunters Association thanks you for your participation and support of the Wild Game Cook-Offs. The continued support of the cook teams vital to the success of LSBA and our ability to help promote our hunting and angling heritage. If you have additional questions, please call Clark Peterson at 979-758-1547.
reading and ultimately to writing. Nevertheless, the indoor writing desk could not contain Brune’s love for the outdoors. that needed riding, and never lost his love for seeing what was over the next hill. Writers Association president to make sure the outdoor message reaches mainstream Texans.